This week I’d like to introduce you to Built by Wendy. A fashion label based in NY, Built by Wendy infuses classic, clean American style with contemporary flair. Each season, designer Wendy Mullin draws inspiration from pop culture and music, from her personal travels, from her Midwestern upbringing, and from classic and contemporary film, art, and literature. These influences reveal themselves subtly in each season’s custom-designed prints and textiles or more explicitly in Built by Wendy’s well-known graphic tees. Built by Wendy always manages to present a fresh take on traditional attire. 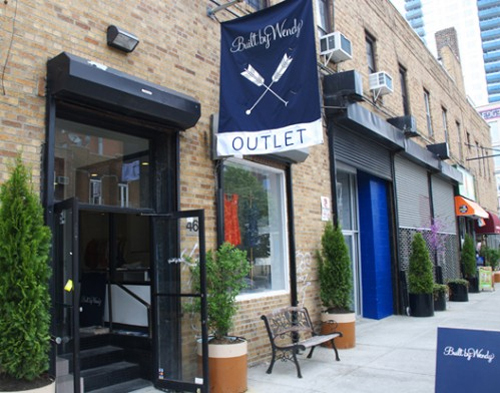 I always stop in at Built by Wendy when I am in NY. The store in Williamsburg is awesome and always full of treats, but I hear it may be closing or already did, so if you want to go, you’ll have to head into Manhattan. I like her inspirations and love of pop culture and musical references, making this Wendy one of my all time favs.